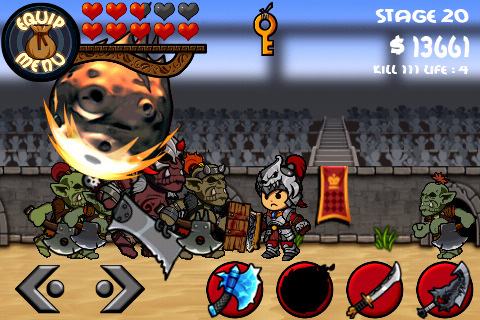 Colosseum by Biscuit Games is a side-scrolling arcade game for the iPhone, iPod Touch, and the iPad. Spectators watch you shed the blood of orcs and skeletons in an unending stream of enemies so you can find the key to move on to the next challenge. As you fight, gathering gold and other items will help you in the arena. Colosseum is a quirky take on an ancient form of entertainment. As a warrior, you move left and right with your left thumb and select up to four weapons to attack with your right thumb. You can press the equip menu button to change weapons during battle. When you see an enemy, throw a projectile weapon such as a knife or an axe to make it recoil. Follow up with another attack until it dies in a shower of blood. Sometimes you might deal a critical hit which will usually kill an enemy until later levels where enemies can survive the hit. Be careful about missing since an orc or skeleton might hit you when this happens. Enemies either appear out of nowhere, come out of the ground or climb out of the stands. There are no boss monsters to fight in Colosseum. When an enemy dies, sometimes it will drop an item that will increase your attack power, defense, speed, and recover some of your health or gold. With the gold you pick up, you can buy a small health recovery potion or weapons and armor which you can upgrade with more gold. The enemies will get stronger and will get defense buffs so be careful. The controls are responsive except if you have four weapons in which case you might press another weapon instead of the one you want so just watch out for that. The game autosaves after a level is completed. There is no leadersboard or co-op for this app. The graphics in Colosseum are polished and colorful. It looks like a more detailed flash game. Your character as well as the enemies will bleed when hit. You can turn the blood on or off. When you pick up a power up item, you will grow taller and bigger than the orcs and skeletons. If you pick up the defense item, you will have an orange tint. The background, enemies, and weapons are detailed although repetitive after some time. For some upgraded weapons such as the knife and the axe, they will have special effects such as burning an enemy or freezing them respectively. The music sounds like something you might hear from a movie during the final fight scene or when someone is along the lines of victory. The sound effects are typical things such as weapons cutting through the air or an enemy saying something when hit. There is no iPod music support but you can turn the music and sound effects on or off. The audio for Colosseum is both repetitive and interesting. Colosseum is not a quick pickup and play game, since the goal is to find a key which is time consuming. 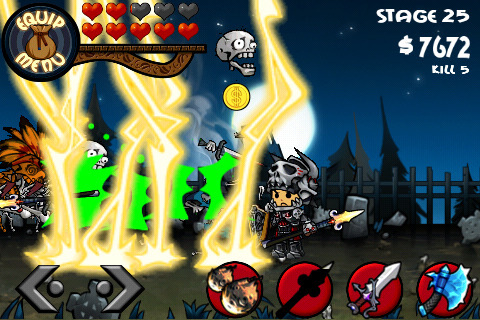 Sometimes multiple enemies will drop a key but only one is used on the current level and cannot be used for the next level. You can select easy to hard difficulty and set the amount of lives to five or infinite. It would be great if Biscuit Games would add more features to make it feel like I am in a colosseum. They can do this by including boss monsters on every five or ten levels and maybe include a way to judge your performance such as spectators throwing tomatoes at you if you are doing poorly or helpful items if you are doing a great job. Sample the free version of Colosseum on your iPhone. AppSafari review of Colosseum was written by Tony Lau on April 12th, 2011 and categorized under Action, App Store, Arcade, Games, Scrolling Shooter. Page viewed 4640 times, 2 so far today. Need help on using these apps? Please read the Help Page.